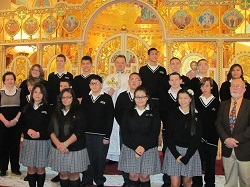 On Friday, November 30, 2012 the Class of 2013 made their way to Divine Liturgy as they had done every Friday for as long as they could remember. This week it was a little different. The class looked like they were walking on air! This was going to be a special day for them. After Liturgy was finished, Father Ivan blessed the rings that would soon be given to the class. 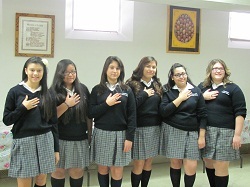 Following the blessing Mr. S. called each student by name to come to Father Ivan to receive their ring. They were then officially The Class of 2013. Following the ceremony, the Class of 2013 posed for pictures, and went to the Church basement for a chance to celebrate the occasion with their families. This was a day that will not be forgotten by the Class of 2013.